Classic car engines are designed to run hot for better efficiency, but not to the extent that they overheat and damage other engine parts by over pressure or loss of water. Suggestions are made that overheating engines are typical faults of older cars and anyone who owns a classic automobile will one day be left stranded and steaming on the side of the highway. When the classic car of yesterday came off the assembly line they initially did not have an overheating problem. The cars cooling system was adequate at the time. (This is mainly true, but the majority of cars during development were never tested in extreme heat conditions, in or a multiple climates, as many are today). After decades without regular maintenance or a complete overhaul, a classic car’s parts, radiator, engine block, hoses, fans and belts have aged considerably and will not be working as effectively and efficiently as they did when they were new. If the temperature gauge on your classic auto shows that the engine is running a bit hotter than usual, don’t delay too long to see into what the car is telling you. This does not mean we need to start tearing apart the car’s cooling system. But it does mean we give the car a series of tests, and with a bit of preventative maintenance, this will ensure your car will keep its engine cool. Preventative maintenance includes replacing any belts that are fraying, show cracks or are slipping on water pumps and cooling fans. Undertake a thorough inspection of all hoses for cracks, swelling and signs of leakage. A sound measure is to check the cars belts & hoses with every oil change and replace them every 5 years regardless of how many kilometres you put on the car. Thoroughly look over the front of the radiator for excessive bugs and dirt – these can be removed with any garden hose and a little bit of water pressure.. Check for any leaks which would be apparent by the accumulation of white or green deposits anywhere on the tank or the tubes. These can be repaired by hot or cold welds which we recommend over adding radiator sealants. The problem with a sealant is that it can effect the flow of water within the radiator core and wear down water pump seals, reducing the systems efficiency. Replace the radiator cap washer . It’s an inexpensive part but essential to proper pressurisation of your cooling system. To check for any radiator blockages, disconnect the lower hose of the radiator and run water through the top. The water should leave the radiator at the same rate as it enters. Very often just back flushing the radiator can open blocked cooling tubes. On older radiators this process may need to be repeated a few times as back flushing can redistribute sediment & cause future problems. 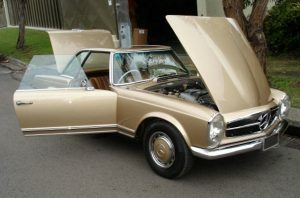 Your classic car’s thermostat is what regulates the circulation of coolant through the automobiles cooling system. The thermostat stays in the closed position when the car is cold and opens as it heats up. As the thermostat ages it can fail and will remain closed which causes your car to overheat. Replace the thermostat if your car is overheating and your radiator, belts and hoses are in good condition. Freeze/Core plugs are located on one or both the sides the of your cars engine block and are designed to protect it from freezing. A blown head gasket will cause coolant to leak from your cooling system and you will see the evidence in your engine’s oil or you will see oil in coolant. Regular checks of the cars fluids should help catch this problem before serious damage occurs. If you have one, check that heater box for any indications of coolant weeping. Rigging a heater bypass can resolve the problem of heater cores rusting from the inside out and are a quick fix until you can locate a new heater core. Not part of the cooling system is the carburetor and engine’s timing, but when they are not properly adjusted they can be a likely culprit to your overheating problems. These simple steps can be difference between keeping your classic car looking and running smoothly or stranded by the side of the road.